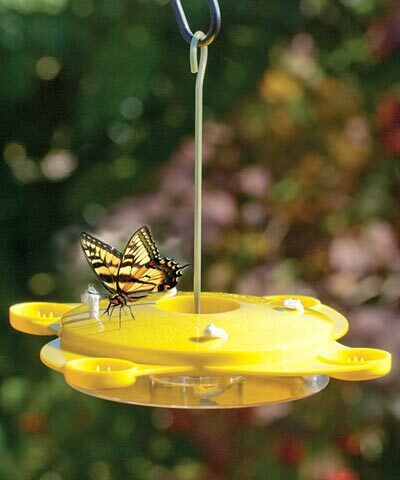 Invite butterflies into your garden with the Audubon Classic Butterfly Feeder. This unit offers a wealth of dining options for the delight of your butterflies. The bright yellow cover has four fabric wicks that simulate flowers, while holes in a butterfly pattern create additional dining spots. Each corner houses a cup, designed for holding pieces of fruit such as bananas, peaches, or strawberries. Integrated stakes in each of the fruit cups keeps the fruit stable, so butterflies can enjoy it more easily. The 12 ounce nectar capacity and numerous feeding stations allow several butterflies to feed at once, and the built-in ant cup in the center prevents pests from ruining the nectar. Use the included hanger to hang this item from a hook or bracket. Enjoy seeing butterflies frequent your garden, feeding from this Classic Butterfly Feeder.